I love purple, because purple can be genius. 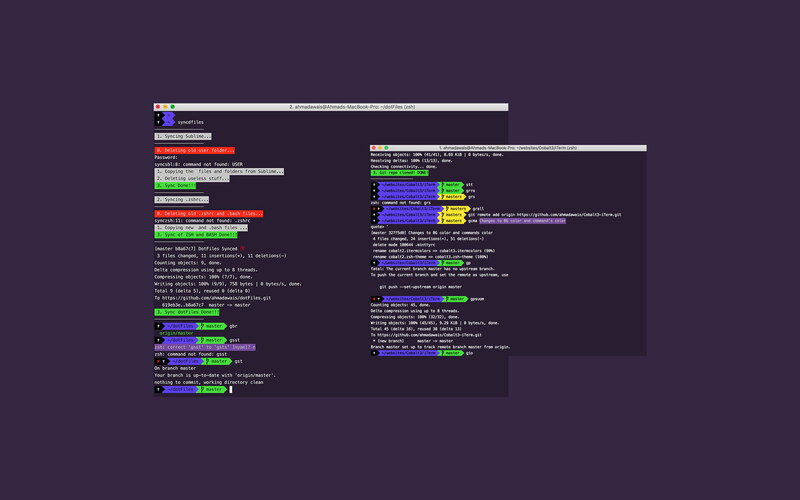 cobalt3.itermcolors is for anyone who uses iTerm2 and wants the colours. The cobalt3.zsh-theme is the prompt layout for zsh users. They work well together! You will need to install the patched powerline font as well. Drop the cobalt3.zsh-theme file in to the ~/.oh-my-zsh/themes/ directory. Open up your ZSH preferences at ~/.zshrc and change the theme variable to ZSH_THEME="cobalt3". In iTerm2 access the Preferences pane on the Profiles tab. Under the Colors tab import the cobalt3.itermcolors file via the Load Presets drop-down. Refresh ZSH by typing source ~/.zshrc on the command line. Cobalt3 is licensed under GPLv2.0. Thank you Wes Bos and all other contributors for all your efforts. Added my own flavor to Cobalt2.